As an established entrepreneur or a successful senior executive, you’ve already proven yourself through your business accomplishments and professional journey upward. But, you may be asking yourself, what’s next? The General Management Program (GMP) is a unique opportunity for successful executives to accelerate their potential by infusing new knowledge and to prepare for new challenges ahead. With the help of our professional executive coaches, the program allows you to tailor your learning journey to your specific needs. At the completion of the program, you will acquire more than just management skills; you will possess a richer understanding of global business, relevant strategies for growth, and new ways to apply this knowledge to propel you and your organization to success. The General Management Program provides a distinguished academic experience like no other. Dr. Eneida Roldan says Wharton’s GMP has advanced her business acumen. The General Management Program consists of six open-enrollment programs, including two electives. GMP is designed to be completed over two years, but you may complete it in only two trips to Wharton's Philadelphia campus by enrolling in multiple programs. Your two electives further personalize your experience. You’ll have the ability to carefully choose each program and customize your education to your exact career goals. Click the Eligible Programs tab on this page to see a list of eligible programs. 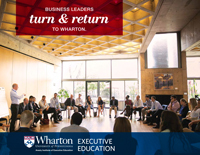 Throughout your learning journey, you’ll experience highly personalized service from Wharton. From the application process and program selection, to executive coaching and one-on-one feedback, you’ll have world-renowned business experts to support and guide you. The General Management Program provides a distinguished academic experience like no other. It’s an exclusive learning journey that allows you to customize your education to your specific knowledge base and continuing career goals. Four core programs are required, combined with two electives, to allow you to make the experience truly your own. The end results will be powerful professional development, a global peer network, and the pride of having a Wharton education. Lynn Krage, Wharton’s Director of Executive Coaching, explains how coaching works in the General Management Program. A highlight of the General Management Program is the inclusion of executive coaching. Your coaching begins on campus after you attend your first GMP program with an introductory session to review the requirements of coaching. If you choose to take advantage of coaching, you will complete a personality assessment and a 360° tool to collect feedback from your organization. Next, a goal-setting session will help you identify the specific outcomes you want to achieve through GMP. You will then meet with your executive coach to create a leadership development plan that both leverages your existing strengths and identifies opportunities for growth. This leadership development plan will be tailored to your organization’s specific needs, recognizing the most valued leadership skills and traits that are necessary for you to succeed in your current role and beyond. You will receive a maximum of six coaching sessions. As you work with your executive coach over six sessions throughout GMP (held in person, online, or a combination of both), you will make stronger connections between your leadership behaviors and performance. You will also work on active behavioral modifications needed to achieve your desired outcomes and attain greater success. In a final session, you will assess your progress and set goals for future growth and development. The General Management Program has been developed for business owners/entrepreneurs and senior business leaders whose professional success will be complemented by focused professional business development, and who recognize that a Wharton credential provides a powerful, competitive advantage in today’s global business world. Who Should Attend: Vice Dean Jagmahon S. Raju gives an overview of the General Management Program. The Admissions Committee may request that applicants also submit a professional letter of recommendation as part of the admission process. If requested, this letter must be written by someone who can attest to your professional achievements and provide additional information about your professional goals. What is the General Management Program? The General Management Program (GMP) is a flexible approach to obtaining an advanced level of executive education. Intended for executives for whom professional development is a priority, GMP is structured to support career advancement with a curriculum that is rigorous, comprehensive, and highly experiential. How is Wharton's General Management Program different from general management programs offered elsewhere? Wharton’s open-enrollment programs are highly experiential and are taught by world-class faculty who offer participants a global perspective in a constantly changing business environment. GMP immerses executives in business knowledge that is timely and relevant, and can be put to immediate use in meeting today’s most pressing business challenges. The hallmark of Wharton’s GMP is its flexibility. Four core programs are required, combined with two electives, to allow you to make the experience truly your own. The end result will be powerful professional development, a global peer network, and the pride of having a Wharton education. Will I become a Wharton alumnus/alumna if I complete the program? Yes, upon successful completion of GMP, you will be granted Wharton alumni status. You will be joining one of the largest business school alumni organizations in the world. With more than 98,000 members who live and work in more than 130 countries, the Wharton alumni network is a powerful community of which you become a part and to which you have access. Upon completion, GMP participants will receive a lifelong Wharton email address, and be invited to global alumni forums that showcase thought leadership from around the world. Also, you will have access to resources that facilitate both personal and professional growth through lifelong learning opportunities. How is GMP different from a MBA? The flexible nature of GMP is what most distinguishes the program from a traditional MBA degree. GMP consists of six open-enrollment programs that you select to meet your individual professional goals, taken on your own timetable over a two-year period. Please note, however, that the six programs do not qualify for academic credit and cannot be transferred or used as a credit toward a degree. In a traditional MBA cohort, participants spend up to two years with their same class of peers. Because the GMP experience is customized learning for the individual, you will meet and interact with many individuals from all over the world, allowing you to create your own powerful professional network. Another way in which the GMP is different from a MBA is the highly experiential nature of the open-enrollment programs at Wharton, which combine a variety of teaching methods. Many of our programs frequently put participants’ knowledge and skills to the test in the classroom through realistic business strategy simulations. Which categories of programs are eligible? Wharton open-enrollment programs that run at least 4 days can count toward completing the GMP. Complete one program each in Finance, Leadership, Marketing, and Strategy, and then complete two elective programs. Six open-enrollment programs in total must be successfully completed. Contact us at +1.215.898.1776 or execed@wharton.upenn.edu for more details. Which Wharton programs are not eligible? Please contact us at +1.215.898.1776 or execed@wharton.upenn.edu for a personalized consultation. Do I have to take three programs each year, or can I complete them more quickly? You may complete the GMP in less than a year. In fact, we have scheduled several of our most popular programs within the same month, which would allow you to complete several programs within a short timeframe. Whatever program sequence you choose, you may complete your program at a pace that best accommodates your professional development needs. The only requirement is to complete all six programs within a two-year period. A Wharton Program Consultant can assist you in selecting the sequence of programs that meets your professional goals and fits your work schedule. Please contact us at +1.215.898.1776 or execed@wharton.upenn.edu for a personalized consultation. Can I take longer than two years to complete GMP? No. The curriculum is designed to be completed in two years or less, and the timeframe for completion cannot be extended. If I previously attended and completed a program at Wharton, can I receive credit toward completing the GMP? If you attended an open-enrollment program within the past 12 months, you may be eligible to receive credit for ONE program toward completing the GMP. Please contact us at +1.215.898.1776 or execed@wharton.upenn.edu for a personalized consultation. I attended a Wharton Custom Program sponsored by my company. Would the Custom Program count toward the GMP? No, we regret that we cannot consider custom programs as eligible to count toward the GMP. 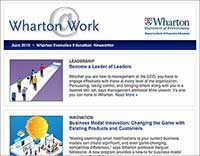 What other executive education programs does Wharton have for senior executives? We have several programs that enable business leaders to harness and exploit the speed of change that’s happening across their industries, markets, economies, and other related aspects, at home and abroad. All are based on real-time business dynamics, economic challenges and opportunities, global trends, and market shifts. Is there an application deadline for GMP? Admissions are done on a rolling basis, so the earlier you submit your application, the better. It is best to apply at least three months in advance of the first program you wish to attend. Upon approval of your application, your first program becomes your entry point into GMP. Do I need to take the GMAT or any other graduate-school admissions exam? No, we do not require an admissions examination to attend an executive education program. I graduated from a university several years ago or already have an MBA. Can I still apply to GMP? Yes. GMP participants come from different professional and educational backgrounds, but what distinguishes them is a commitment to lifelong learning and professional advancement. GMP is ideally suited for senior leaders who are preparing for their next challenge within their organizations or beyond, and that means becoming “ambidextrous” in business — seeing all perspectives and being equipped with a new global network and framework to draw upon. English isn't my native language, and I don't work in an English-language environment. Can I still attend GMP? All GMP candidates must be fluent in English to complete reading assignments and to actively engage in group discussions and activities. Being able to fully communicate in English with your executive peers and Wharton faculty is an integral part of the experience. If you have taken the Test of English for International Communication (TOEIC) within the past two years, your score must be 800 or higher. If you have less than one year’s experience working in an English-speaking environment, or if you are unsure about your current level of English, please contact us immediately at execed@wharton.upenn.edu. We can better advise you then. How much does GMP cost? What forms of payment are accepted? The total GMP fee is $69,000. This includes tuition for six open-enrollment programs, executive coaching, private accommodations, most meals, and all program materials. Payment can be made by check, wire transfer, or credit card. A $15,000 deposit is due within 30 days of acceptance into the program. This confirms your attendance in the GMP. The balance of $54,000 is due within the next 60 days, or 90 days after acceptance to the program. I've been accepted to GMP, but I'm unable to attend and wish to cancel my enrollment. What should I do? If you wish to cancel enrollment in one of your selected GMP courses, we are more than happy to reschedule your attendance for the next program date, or we can work with you to identify a more convenient session. If you wish to withdraw entirely from GMP, please contact Wharton Client Relations at +1.215.898.1776 or execed@wharton.upenn.edu to discuss your specific situation. We will allow participants to transfer between different dates of a specific program with at least 10 days’ notice before the start date. Cancellations received more than 90 days prior to the start of the first program in your learning journey will receive a full refund. Cancellations received less than 90 days prior to the first program’s start date will incur a charge of $15,000. Please note that after you have taken your first program in GMP, no refunds will be given. Requests to cancel or defer participation in GMP must be made in writing and submitted to Wharton Client Relations at execed@wharton.upenn.edu. I have a question that isn't addressed here. Whom can I contact? For more information, please contact Wharton Client Relations at +1.215.898.1776 or by email. Mike BarthlowVice President & General Manager, Cubic Corp.
Colin GantVP, Vessel Refurbishment, Norwegian Cruise Line Holdings Ltd. I started my business in 2001. We provide quantitative analytics services to buy-side and sell-side firms on Wall Street. As the business started to grow, it became necessary to hone some skills and gain the knowledge to run the business better. For me, the General Management Program from Wharton was a better option over a regular MBA. I chose GMP from Wharton over Harvard’s or University of Chicago’s comparable programs because it was very similar to the MBA curriculum and taught by the very best professors. The program is also customizable to your preferences. In my case, that was finance. I chose four core programs in operations, strategy, marketing, and finance. For electives, I chose two programs in finance. Another important fact that resonates for me is that the GMP program is very experiential. For example, in the leadership program, we got to lead different teams and experiment with new leadership models in dynamic and volatile situations, and in one of my finance programs we analyzed and optimized companies’ capital structures. I plan to complete this program in less than a year. It’s an honor and privilege to become a Wharton alumnus on completion of the program. It goes without saying that GMP from Wharton will not only sharpen my management skills, but also help grow my business." Download the program schedule, including session details. Tuition for Philadelphia programs includes lodging and meals. Schedule a personalized consultation with Maria Minniti, Director, Senior Leadership Programs. Still considering your options? View programs within Comprehensive Executive Programs, Finance & Wealth Management, Marketing & Sales, Strategy & Innovation, Leadership Programs or use our Program Finder.